Overwatch is one of those games you either love or really love. It’s got a bunch of heroes for every different playstyle, meaning there’s someone for everyone. I’m a tank, mostly because I have to be. Here are some badass Overwatch phone cases to gussy up your phone with. Just like the heroes in the game, there’s something for everyone! 1. Everyone Loves Hanzo, Right? I hope his namesake is Hattori Hanzo from Kill Bill. Whether it is or not, I’m going to continue telling myself it is. He’s a good character to use if you do well with snipers that are fast and stealthy. His arrows might not be able to reach the distances that, say, Widowmaker can, but what he loses in distance, he makes up for in speed and agility. You can get these arty Overwatch phone cases for a few of the characters by the same designer. I just had to give the props to Hanzo by… bowing down. This design plays with Marty McFly’s legacy, giving us the one person cooler than him that isn’t Ferris Bueller: Tracer. 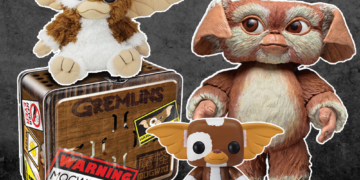 (If you liked those references, you’re probably my age — sorry — and will appreciate these Gremlin toys!) Tracer’s my favorite of the heroes that I’m not very good at and, definitely, the one to use if you’re gonna do a Back to the Future call-back, so well played on this. Well played. Tracer is pretty much if Holtzmann from Ghostbusters could time travel. Doctor who? And also that they have to personally go and find it in Hanamura to buy one for themselves. Alternatively, you could be a good friend and tell them about this list of Overwatch phone cases. Since everybody likes something different, it’s not always a given that you’re both gonna turn up to the Spring Fling with the same phone case. Then you can go and eat ramen afterward together. There! Everyone’s happy and hip! One day I’ll share my favorite non-geek related video on youtube that involves a kitten so excited to be nomming its food, it’s meowing. I get that Reaper has a reputation to uphold, but how can you not be charmed by a cat? The Internet should, by and large, dislike him on behalf of this, but considering he’s a pretty deadly flanker that I’d say we’re all a bit afraid of him. Maybe if we all held adorable kitties, then we’d come out on top. Just maybe. I mean, I’ve got Find My iPhone enabled, so HA. I’ve never had to use it so who knows if it’ll work or not. If you try to unlock it, you won’t be able to unless you cut off my fingertips. Which, don’t. I’m a writer, gamer, and a guitar player. I need those as much as my phone. A lot of people are kinda sick of this phrase if you listen to the fandom. I don’t, so I’m not, and Lucio is another one of those heroes I wish I was good at. Out of all the Overwatch phone cases, if you’re looking for one that annoys the too-serious-gamer types, here you have it. Being a support hero is a thankless job. All you do is get yelled at while you’re doing your job to the best of your own abilities. Of all the supports, Mercy is a field medic who’s job is to patch up the team where and when needed. She can not, however, work miracles. If you’re going to run off on your own then complain, it’s not them, it’s you. Mercy deserves this mug and this face is also the exact one I make when I’m playing support. Before becoming D. Va, she was a gamer like you are and I am and spent her nights beating people from all over the globe at games. I know those feels (sometimes, others I know those losses). The funniest part of this Overwatch phone case is that I actually do lie like this to game. My back may ache, my muscles may be sore, but I can sure pack a punch when I’ve got bubble gum and some pretzels. One of Tracer’s most refined characteristics — other than her goggles and general badassery — is her accent. She hails from London (represent!) and her manner is super Millennial-English. To continue on the English thing, it’s proper cheeky for me to stick more than one Tracer design in an OVERWATCH phone cases article, but there’s also so many to choose from, and she’s almost always picked at the start. She can’t help being popular! Also, if you’re looking for more geeky phone cases, you might also dig this Deadpool phone cases article!